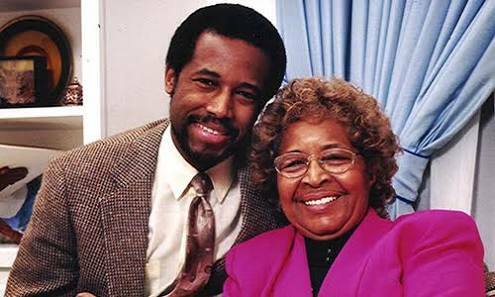 One of 24 siblings, half of whom she never knew, Ben Carson’s mother Sonya grew up in foster homes until the tender age of thirteen–the youngest you can be and yet be called a teenager. At thirteen she married a man who called her his “china doll” and some years later had two sons. When she found out her husband was a bigamist she made the difficult decision, her sons loved their father dearly, to leave him. Renting out the house she received in the divorce settlement, Sonya, with her sons, temporarily moved into a tenement with one of the sisters she did know, and took 2 and sometimes 3 jobs as a domestic to support herself and her sons. She had only attended school up to third grade. She did not know how to read. Younger son Ben had never done well in school. Now, he was deeply saddened by the absence of his beloved father. Convinced he was the “dumbest kid in the fifth grade,” Ben brought home test grades and report cards that seemed to confirm his opinion of himself. His older brother wasn’t doing well with his studies, either. What could an illiterate mother, who had married at 13, was now divorced, and struggled off and on with serious depression, do to help her growing boys? She worked such long hours cleaning wealthy people’s houses that she wasn’t even there during the kids’ after-school time, often not arriving home til they were in bed. Want to take a moment and predict the outcome before reading on? At first Sonya didn’t know what to do, but she knew that she had to do something to help her boys begin to live up to their potential. And though she didn’t know what to do, she knew Someone who did know. So she prayed and asked God for wisdom and guidance. She also paid attention to the habits of the high achievers she worked for. She made some decisions and told her sons about them: they were to choose and read two library books per week and hand in book reports to her (they didn’t know she couldn’t read), and they were to limit TV to two pre-selected programs per week, watchable only after homework was done. Two books per week! Benny thought, alarmed. He had never read a book in his life. And how would he live with almost no TV? To top it off, Ben had a terrible temper that even he realized would land him in jail one day if he didn’t learn to control it. Ben’s mother repeatedly told her sons that they could do anything anybody else could do, and do it better, if they would only work hard at it. She always had faith in them, and she never accepted excuses. She made none for herself, and would accept none from them–for their own good. My husband and I just watched the film Gifted Hands: The Ben Carson Story with Cuba Gooding Jr., and what you just read is only a small part of this amazing true story. It’s one of the most inspiring and motivating stories we’ve seen in a long time. Ben Carson went from the bottom of his fifth grade class to the top of his sixth grade class in one and a half years. He earned a scholarship to Yale and became the head of pediatric neurosurgery at Johns Hopkins Hospital when he was thirty-three years old. He was one of the youngest people to ever hold such a position, and the first black person to have a position like that in a world-renowned medical center. In the first seven years of his career, he performed breakthrough surgeries that changed the lives of his patients. I believe every parent and every child has something wonderful to gain by watching this film. We plan to watch it with our grandsons soon.